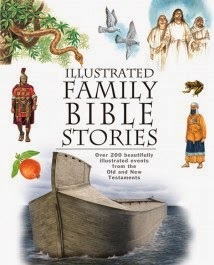 Illustrated Family Bible Stories published by New Leaf Press (a division of New Leaf Publishing Group), has been a joy to read and review. This hardback book is roughly 250 pages, and they are colorful and informative. I've been reading aloud from this book to all the kids, who range from 8 to nearly 17, and they are all enjoying it. The "story" portion is definitely geared towards the younger two, but there are great illustrations -- realistic illustrations, not cutesy, silly ones. There are also lots of extra little historical notes, archaeological notes, cultural notes, etc. Those are what interest my big guys. I like that I can sit down and read a section like "God's Chosen People" and get plenty of information for everyone. This two-page spread talks about patriarchs, Abraham, Isaac, Jacob and Joseph, with about a paragraph for each. There are sections titled Tent dwellers; Places; Travel, trade and commerce; and Customs. Those each get about a paragraph too. Illustrations include a mosaic from the royal tombs at Ur, drawings of Abraham about to sacrifice Isaac, Isaac blessing Jacob, Joseph interpreting dreams, and Hagar, the mother of Ishmael. There is a photo of a Bedouin tent dwelling and of camel trains in the desert. There is an illustration of a plastered skull found at Jericho. And there is a half-page map that shows the region and the important cities for this lesson. Help Bible history come alive for children as well as new believers so they know these true events that changed the world forever. Who's who in the Bible, maps and diagrams, a Bible quiz, and more! With the help of maps, photographs, and diagrams, the ancient cultures of the Bible are set in a context that can be readily understood. In addition, specially written teaching helps to educate today's young reader in understanding the Bible's meaning and its relevance for everyday life. I think that is a good description. I always like when the description actually describes the book, don't you? I think this title is best for elementary ages, but it is certainly not babyish for a big brother or three (in our case) to be listening in as well. You can go see what other Moms of Master Books have to say about these Awesome Science titles. There is a Book and a Treat Facebook party coming up later this month, April 29 at 7 pm Central Time, where you could win cool prizes -- and discuss the series too.